The art of kirigami involves cutting paper into intricate designs, like snowflakes. Physicists are applying the same technique, using paper that’s only an atom thick, to create some of the smallest machines ever made. 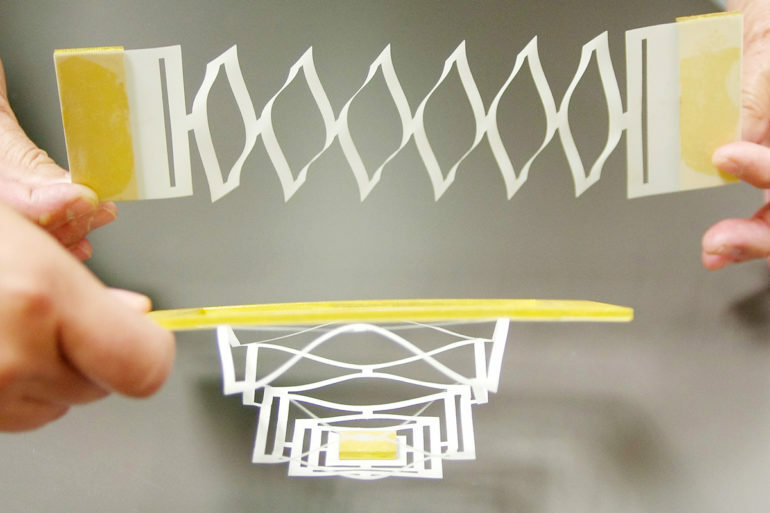 The team demonstrated kirigami on the nanoscale using 10-micron sheets of graphene (a human hair is about 70 microns thick), which they can cut, fold, twist, and bend, just like paper. Graphene and other thin materials are extremely sticky at that scale, so the researchers used an old trick to make it easier to manipulate: They suspended it in water and added surfactants to make it slippery, like soapy water. They also made gold tab “handles” so they could grab the ends of the graphene shapes. The study’s first author, Melina Blees, a former physics graduate student at Cornell University and now a postdoctoral researcher at the University of Chicago, says she received an “enthusiastic welcome” from the art department, where the researchers spent time in the library studying paper and fabric designs and dreaming up ways to translate them to graphene. “It was really true exploration, cutting things out of paper and playing with them, trying to imagine how a ‘hanging kirigami mobile for kids’ could become a nanoscale spring for measuring forces or interacting with cells,” Blees says. With one sheet of graphene, for example, they made a soft spring, which works just like a very flexible transistor. The forces needed to bend such a spring would be comparable to forces a motor protein might exert, says McEuen, a professor and director of the Kavli Institute at Cornell for Nanoscale Science. Entering the realm of biological forces, the experiments open up a new playground of ideas for flexible, nanoscale devices that could be placed around human cells or in the brain for sensing. 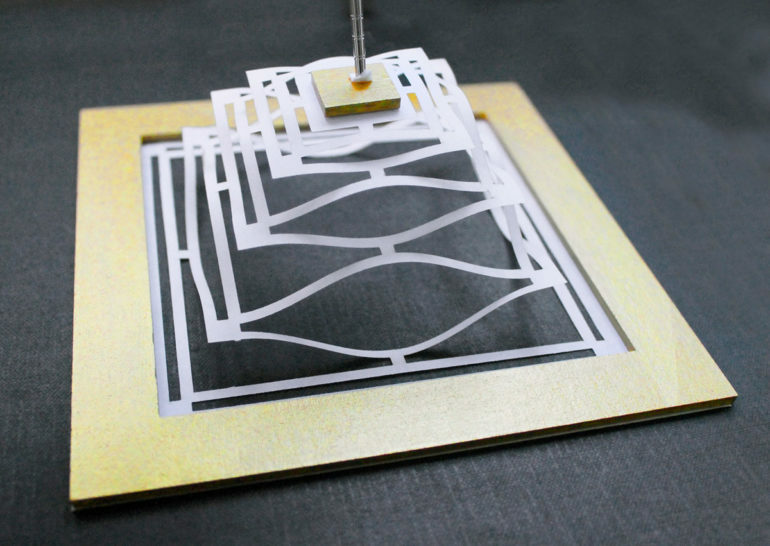 The researchers also demonstrated how well graphene bends in a simple hinge design, quantifying the forces needed. Opening and closing the hinge 10,000 times, they found that it remains perfectly intact and elastic—a potentially useful quality for foldable machines and devices at that scale. The National Science Foundation, the Office of Naval Research, and the Kavli Institute at Cornell for Nanoscale Science funded the project.